I’ve gone rogue on you, I tell ya’! Me, making more cookies? Unheard of! Unlike the dreaded cakes and pastries, it appears I’m able to make some humble cookies without a complete disaster. Once again, I got this fabulous recipe from my friend Jodi over at The Creative Life in Between. She’s the cookie-maker queen! My mom sent me a couple of pounds of Texas pecans for Christmas, and another dear friend gifted me some candied pecans. 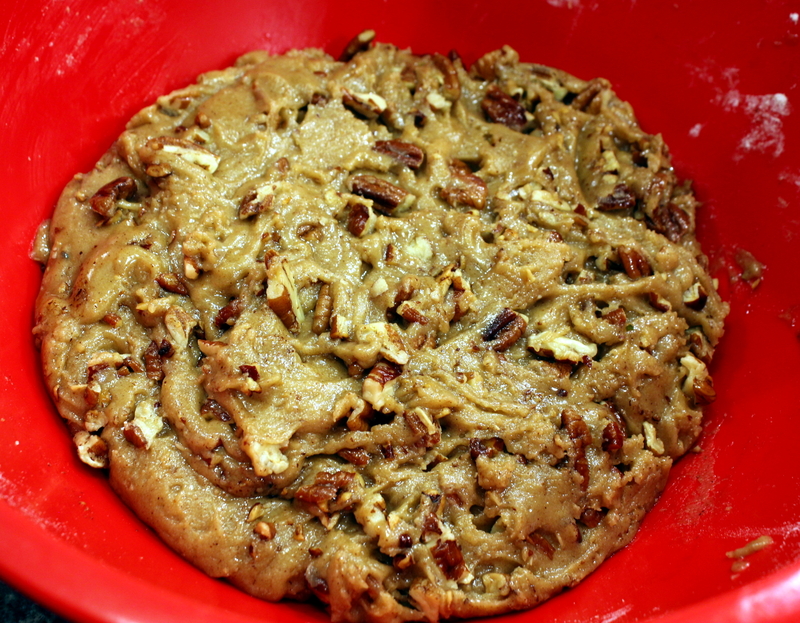 So when Jodi posted her Butter Pecan Cookie recipe… well, you get the picture. I halved the original recipe, so the smaller version is below which makes about 3 dozen cookies. And for whatever reason, this cookie recipe didn’t really need a high-altitude adjustment aside from maybe a minute or two cooking longer. I put the candied pecans on top, and omitted the raw sugar topping. We kept a dozen for ourselves and the rest I brought to a USPS potluck on my last night of work as a Holiday Clerk Assistant. I survived six weeks helping to bring your holiday mail and packages to your doorstep! That certainly deserved a cookie or two. 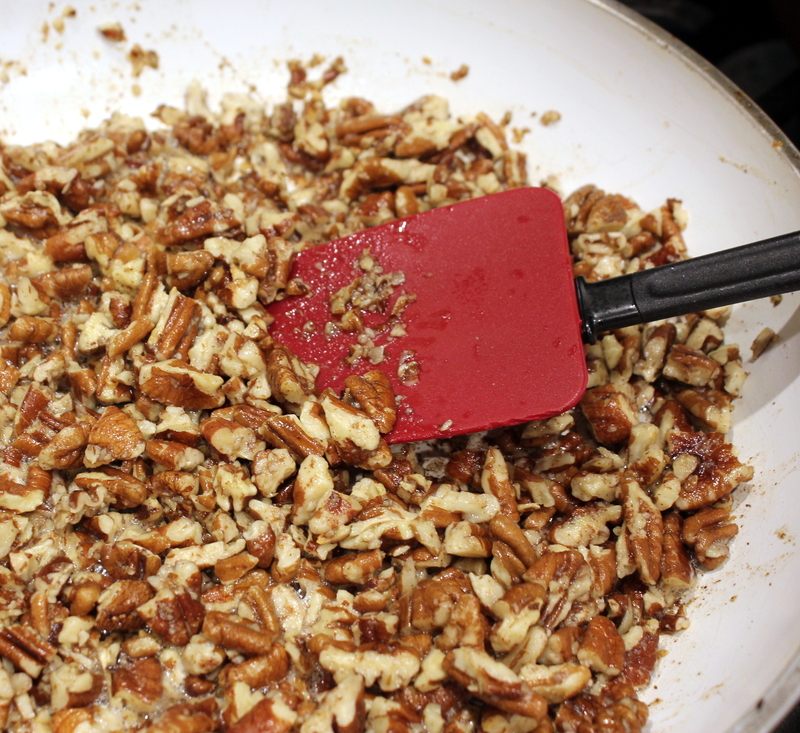 Prepare buttered pecans by melting 1 1/2 tablespoons butter in a large skillet over medium heat. Add chopped pecans and cook, stirring occasionally for 4-5 minutes, until lightly toasted. Remove from skillet to a bowl to cool. In same skillet, melt 2 sticks of butter for cookie batter. 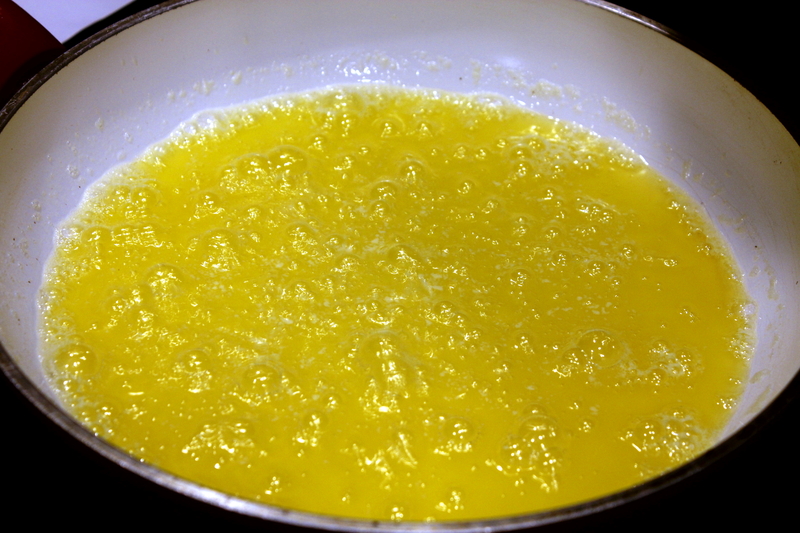 Bring to a boil until butter just begins to brown, and then remove from heat. Be careful not to burn it as that tastes bitter, but be sure to get it to the browned stage. Browning the Butter ~ yes, you really do boil the butter! Using an electric mixer, combine sugars with browned butter on slow speed until fully combined. Add vanilla and then eggs, one at time, beating until fully combined. Add flour, cornstarch, salt, cinnamon, and baking soda – folding in with rubber spatula until fully incorporated, and then fold in the buttered pecans. Cover bowl and refrigerate at least 2 hours or overnight. If you have refrigerated overnight – let dough sit long enough to become scoopable. Place ping-pong-ball sized scoops of dough 1-2 inches apart on baking stone or cookie sheet. Flatten slightly and press a pecan half in center. Bake 8 to 11 minutes. Remove from oven and let sit on baking stone/cookie sheet for 10 minutes, then remove to cooling rack to cool completely. My favorite nut, for sure! These crispy cookies must be a hit!! Yes! Yumyumyumyumyumyumyumyumyumyum!!!!! My favorite! I love your step by step photos, Kathryn. Hugs! We loved them at home so much that they are gone already! I wish I had more too. I can’t say about the potluck people, there were so many desserts. I’m sure they were gone by the end of the night, I left right after eating as USPS said the holiday workers could go home, our contract was finished! Oh wow, thank you so much. They are truly delicious, I hope you enjoy them as much as we did! Great, hope you enjoy them, thank you! 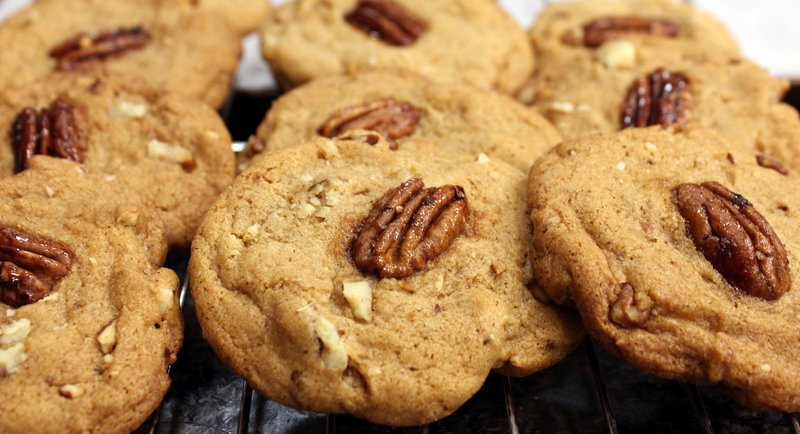 I love pecan pie, so why not pecan cookies! Exactly Mad Dog, thank you! Those are some good-looking cookies Kathryn! Butter and pecans – what’s not to like! Crazy good they are, thanks Judi! Yum! This is inspiration for us who don’t bake. Mmmm. I wish I had them all to myself, our are already gone now! Thanks Diana, hope you are too. So weird we’ve had no snow yet this year and last year this time we were under three feet of it! These cookies look too good to have sitting around. Yum! Thanks so much, they certainly didn’t sit around for long! See, baking isn’t so hard 🙂 Making beurre noisette is actually quite challenging, but I’m sure it tastes real well in cookies. I’ve never tried that. You are most welcome, thank you too! Great job on the cookies! I’d say that’s a perfect use of some of your pecans. 🙂 You just reminded me, I have packages to send…not Christmas packages, just some things for my daughter. Enjoy your respite!! Jodi is awesome! I love her recipes and art work! These look so yummy! Thank you my friend, super yummy! Jodi IS awesome! This is great! I love pecans also. I’m glad you altered the recipe to 3 dozens. That’s about all I would want to make. 6 dozen would have been crazy! Beautiful recipe. I love to bake and bookmarking this. Thank you Kathryn. this looks super delicious!!!! mouth watering!! Thank you so much!! A favorite!